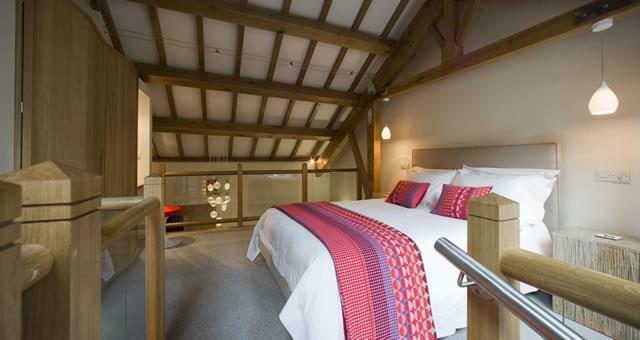 Hart Barn017684 82647work017684 82836fax Self-cateringWinner of Cumbria Tourism's Self-catering Property of the Year 2017 - Hart Barn is a stylish contemporary retreat for two, spread over three floors with over 800 square feet of living space and gorgeous views. The barn was painstakingly rebuilt in 2010/11 and has a vaulted green oak structure and double height living area plus the comforts of a 21st C home combined with the indulgence of a 5 star boutique hotel. Linking all three floors is the main feature of the house: a unique spiral staircase constructed from old oak railway sleepers and polished stainless steel. However it is the attention to detail and the owners desire to seek out and support local artists and crafts people which makes Hart Barn really special. The best of contemporary Cumbrian design coupled with the owners passion to restoring old buildings. The Perfect designer retreat in the heart of glorious Lakeland. Hart Barn offers weekly bookings starting on Saturday and short breaks of 3 days starting on Saturday and of 4 days starting on Tuesday in some seasons. Hart barn is a stunning holiday let, extremely well designed with all the extras you could wish for provided. The property has a stylish kitchen on the ground floor linked by an incredible spiral staircase, the first floor has a bathroom that is luxurious & a lounge with exceptional views from the window. 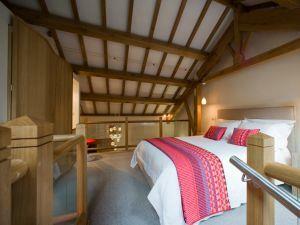 The top floor mezzanine contains the bedroom with king size bed dressed in quality bedding. The owners are both helpful & friendly. All in all a great place to stay in the lake district. It was lovely to meet you and we are delighted that your enjoyed your holiday and thank-you for your generous feedback. Winner of Cumbria Tourism's Self-catering Property of the Year 2017 - Hart Barn is a stylish contemporary retreat for two, spread over three floors with over 800 square feet of living space and gorgeous views. Sky HDTV and with movies pack. Free local/national telephone calls.Logs for wooburner included. Tariff aslo includes Egyptain cotton linen & towels, L'Occitane toiletries and concierge-style service. Superfast broadband. Pub 1 mile, shop 2 miles, boat hire 3 miles, Ullswater Steamer Pier 3 miles. Walks from door. By car: A592 Kirkstone Pass road 10 miles north of Windermere, past Brotherswaters on left hand side and then right turn into the Hamlet of Hartsop. By train/bus: To Windermere and then in the summer taken the 517 Kirkstone Rambler to Hartsop Road end. The barn is in a shared courtyard up a rough track in the centre.